Days after making her latest enigmatic offering with a radical proposition for the future of silhouette, Rei Kawakubo was present in Paris overnight for a preview of her forthcoming Costume Institute exhibition, The Art of the In-Between. 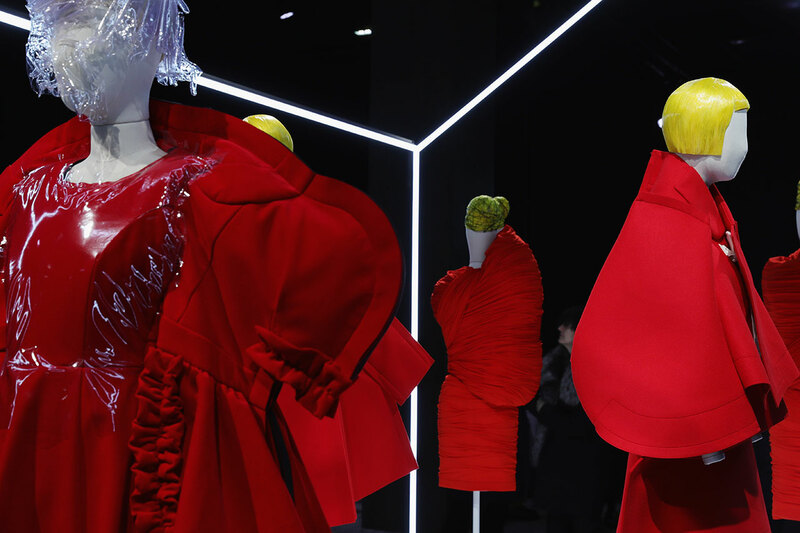 The preview, comprising five examples of Kawakubo’s work all rendered – topically enough – in red, spanned Commes des Garçons collections from between Spring 1997 and Spring 2017. They were also documented in photographs by iconic Italian lensman Paolo Roversi on models including Anna Cleveland, Ruth Bell and Alexandra Agoston. The Metropolitan Museum of Art’s Costume Institute spring 2017 exhibition, Rei Kawakubo/Comme des Garçons: Art of the In-Between, runs from May 4 until September 4 and will interrogate the reclusive Japanese designer’s fascination with the liminal spaces between boundaries and the challenge it presents to conventional notions of beauty, good taste, and what constitutes a garment, let alone the concept of fashion. Presented as a thematic exhibition of 150 works and not a career retrospective (wise, considering that Kawakubo is still very much in the vanguard of experimentation in fashion) The Art of the In-Between is The Costume Institute’s first monographic show on a living designer since the Yves Saint Laurent exhibition in 1983. The exhibition itself will be divided along the following thematic lines: Fashion/Anti-Fashion, Design/Not Design, Model/Multiple, Then/Now, High/Low, Self/Other, Object/Subject, and Clothes/Not Clothes. In support of the exhibition, the Met Gala will take place on Monday May 1 and will be co-chaired by Tom Brady, Gisele Bundchen, Katy Perry, Pharrell Williams, and Anna Wintour.